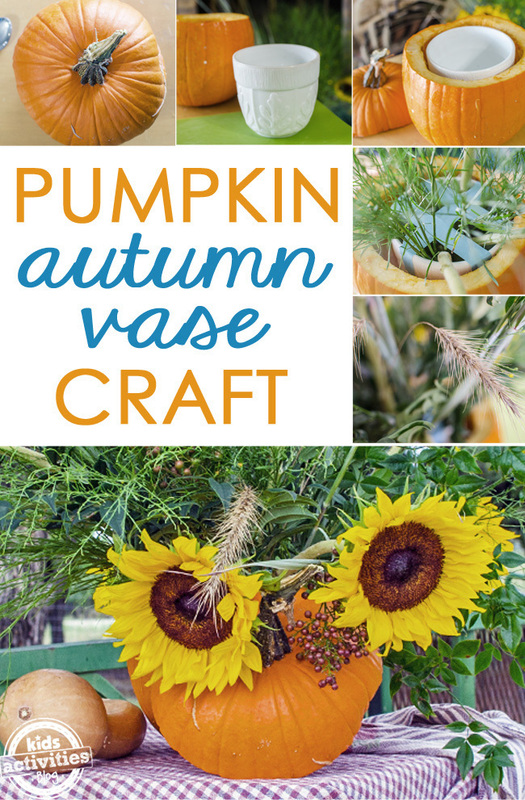 Our Pumpkin Autumn Vase Craft is such a fun kids activity for fall! It’s a great way to get into the mood for cooler weather and the autumn season (yes, please!). 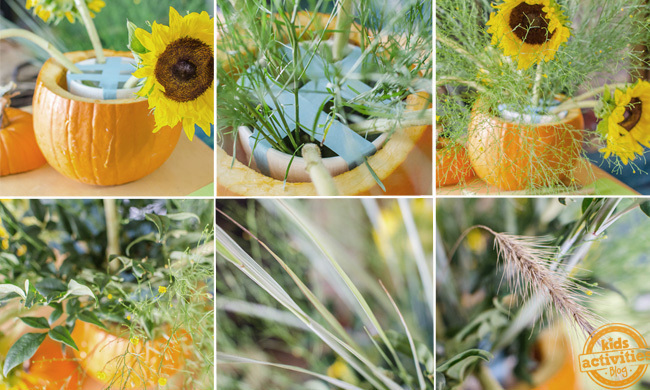 Younger kids will love helping pick out pretty fall flowers and older kids will love helping hollow out the pumpkin and arranging the flowers. Some of the flowers and greenery we chose came from our property. You could go on a nature hike with your kid and gather things to add to your floral arrangement. I think every kid should learn the basics to flower arranging, because it’s a great lifetime skill to have. Also check out this frugal fall craft that show you how to Make a Book Pumpkin–what a great way to upcycle an old book! 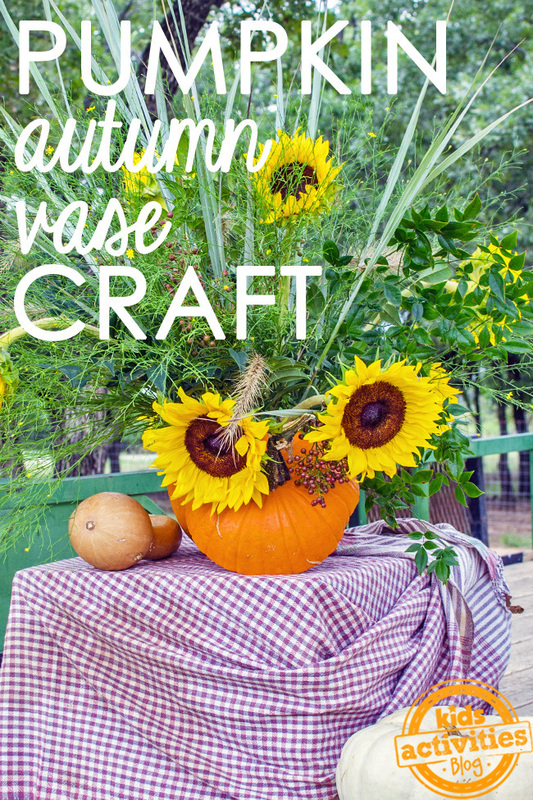 As a mom, I love this Pumpkin Autumn Vase Craft because not only do I get to spend time with my kids being creative, but also because the end product is something I can proudly display in my home. It makes a great fall centerpiece and conversation piece for the dinner table or coffee table. When choosing a pumpkin, make sure to pick one that is blemish free with a thick skin. I like to save the seeds for roasting later. Using a sharp knife, cut out the top of the pumpkin roughly the same circumference of the vase you will be using. Scoop out the flesh and seeds. Set aside to save for roasting later. Fill vase that will fit inside the pumpkin about half-way with water. You can add a floral packet at this point. This is supposed to help the flower arrangement to last longer. Use floral tape, masking tape or scotch tape to form a criss-cross pattern over the top of the vase like so, as this makes the flower arrangement more stable and easier to work with when arranging. Using sharp scissors under cool water, snip off the ends of the flower stalks and any lower leaves. When I arrange flowers (and I am certainly no expert) I like to add the tallest and most prominent flower first. In this case, I added the sunflowers. Then fill in the empty spaces with smaller flowers and greenery. It’s always a good idea to add a variety of different textures and colors for additional eye appeal. Fill with water to about an inch from the top of the vase and insert vase into hollowed out pumpkin. Adjust the flowers as necessary. 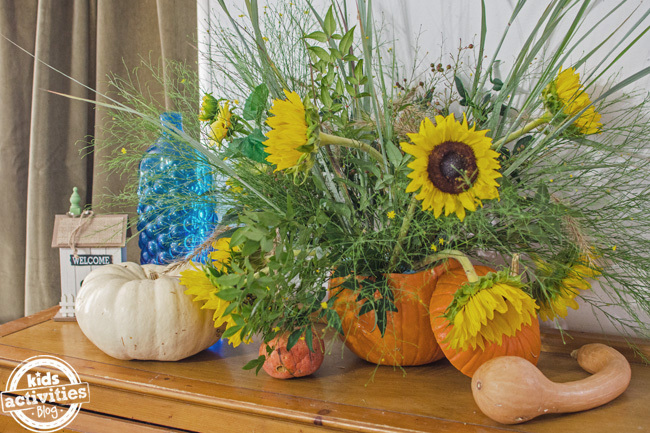 Display your finished Pumpkin Autumn Vase Craft with pride. 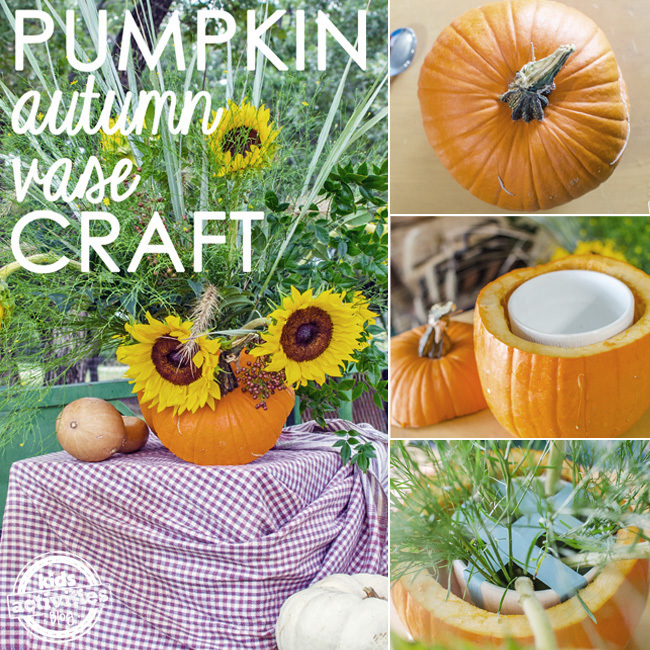 This craft is perfect to do at any time during the fall season.